Audio Research DS 225. Solid State power amplifier. 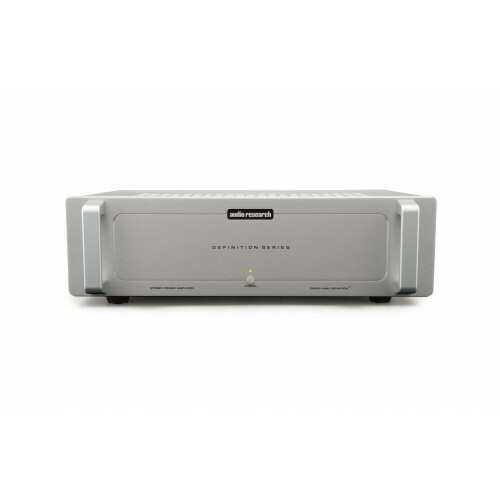 With the introduction of the DS-series amplifiers, Audio Research has proven that high power output, great sound quality, and high efficiency can all come together in a single package. The DS225 adds another chapter to the Definition Series amplifier story, taking the proven format of the DS450 and scaling it down slightly in size and power, producing an ample 225 WPC into an 8-ohm load. Housed in a chassis the same size as the DSi200 integrated, the DS225 continues the design hallmarks of the DS450. Audio Research’s proprietary Class D all-discrete analog switching mosfet output technology is again combined with a large, linear analog power supply, yielding tremendous speed and power delivery, but doing so with cool-running efficiency, idling at only 38 watts. The DS225 is another true “green” amplifier designed for economical, maintenance-free operation and long, reliable service life—it can even be placed in an enclosed cabinet without a second thought. The DS225 will drive almost any speaker available today with ease. The DS225 is a global feedback-free, fully-balanced design with both XLR balanced and RCA single-ended inputs. Dual Cardas patented binding posts are featured, 12V triggers are included, and there is a 15A IEC connector on the rear panel. The DS225 is available with a natural anodized, brushed-aluminum front panel with silver handles and silver top cover. A black anodized front panel is also available with black handles and a black top cover. Other finish combinations can be ordered to match older products or to suit your taste. Like its two predecessors, the DS225 has an uncanny ability to resolve information and place musicians firmly within a large soundstage – even at low levels. You’ll hear none of the “dead zone” effect at low volume that is common to other conventional switching designs. Bass control, reach and impact are all superb, while musical dynamics are instantaneous; the DS225 is very quick on its feet. In addition, the amplifier has an extremely low noise floor, allowing instruments to emerge from a black background. Tonal balance is neutral, fine grained and relaxed. The DS225 distances itself from other switching amplifiers, sounding like an extraordinarily refined, discrete, class-AB amplifier deserving of the Audio Research pedigree. 225 watts per channel into 8 ohms, 1% THD; 360 watts per channel into 4 ohms, both channels driven. (-3dB points at 1 watt) 5Hz to 55 kHz. 2.15V RMS for rated output (26.0dB Gain) single-ended or balanced. 150K ohms single-ended, 300K ohms balanced differential. Non-inverting from single-ended inputs. Balanced pin 2+ (IEC-268). 0.06dB 8 ohm load to open circuit (Damping factor 167). 15 amps peak at protective shutdown. 5 volts/microsecond. (20% maximum duty cycle). 300 microvolts RMS (103dB below rated output IHF A-weighted). 100-125VAC 60Hz (200-250VAC 50Hz) 488 watts at rated output (225WPC 8 ohms), 758 watts at 360WPC 4 ohms, 35 watts idle, Standby 1 watt. 19" (48 cm) W (standard rack panel) x 5 1⁄4” (13.3 cm) H x 14 1⁄4” (36.2 cm) D (front panel back). Optional handles extend 1 1⁄2” (3.8 cm) forward of the 1⁄4” thick front panel. Output connectors extend 0.9" behind rear panel. 34.9 lbs. (15.8 kg) Net; 41 lbs. (18.6 kg) Shipping.